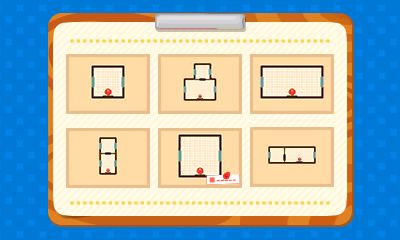 Many new features can be unlocked in Animal Crossing: Happy Home Designer through the Happy Home Handbook Lessons with Play Coins. These lessons include ceiling items, expanded rooms layouts, refurbished items, and more. To purchase a new lesson and unlock the associated feature, sit down at your desk where you save the game and pick the “Study the handbook” option on the touch screen. 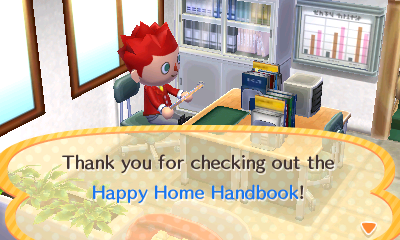 If the “Study the handbook” option is not yet available, you must wait until you get to the 9th in-game day when Tom Nook shows up to introduce the Happy Home Handbook to you. A list of available lessons and previously purchased ones will appear, just tap the one you want and press confirm to learn it. Keep in mind that you can only purchase one lesson per in-game day, save and proceed to the next in-game day to unlock more. Even More Designs 5 Play Coins Unlocks the sewing machine upstairs, including QR Codes. After completion of "Custom Designs"
What are Play Coins? How to obtain them? Play Coins are a system-level feature on the Nintendo 3DS. By taking steps with your Nintendo 3DS in sleep mode, the system’s pedometer will award you Play Coins for every 100 steps taken, with a limit of 10 coins per day. Alternatively, put your Nintendo 3DS to sleep and shake it for a few minutes! Interested in raising your interior designs to the next level? How about…to the ceiling! You can select ceiling decor from the ceiling catalog. It’s that easy! Lamps, chandeliers, and mirror balls are just a few of the items you can use to decorate ceilings! Just make sure you don’t place ceiling decor above any tall furniture items! Use custom designs to make completely original designs with the stroke of a stylus! Tap Pencil Icon to create your very own custom design. Use your imagination to draw something amazing! Warning!  Your custom design may be viewed by other users via Miiverse or communication features. Don’t draw anything you don’t want to share with others or that infringes on others’ rights. And don’t draw anything distasteful or anything that would hurt anyone’s feelings! If you’re looking for a little more than what you can do with custom designs check out this special design tool! If you use this machine, you can make long-sleeved shirts and dresses. That’s so cool! You can even use QR Code patterns to introduce other people to your designs and receive designs yourself. Use this machine now to open the door to an amazing new world of designs! You can now design items such as windows, curtains, and doors–without a doubt, the things that really make a house a home! Change windows, doors, and other such items from the catalog. Each room can have its own windows, curtains, and door designs, so hop to it! If you want to refurbish furniture, Cyrus from Re-Tail will remake your items with professional care. Just tap and slide furniture blocks over to the refurbish box for easy refurbishing. For some furniture, you can change the color and fabric or even decorate with one of your custom designs! But you may not be able to refurbish ALL types of furniture. Oh well! Mysterious furniture that makes strange sounds? Sign me up! You can now find gyroids in your catalog! There are 131 kinds of gyroids, including four rare Brewstoids–a must-have for the gyroid connoisseur. Gyroids are great, but they are even more fun when you combine their noises with music. The sounds they make will astound and inspire you! The next big step in home design is choosing a floor plan. You can now make rooms bigger and increase the number of rooms–something your high-class clients will really love. This guide is in progress and will be updated with more information soon.